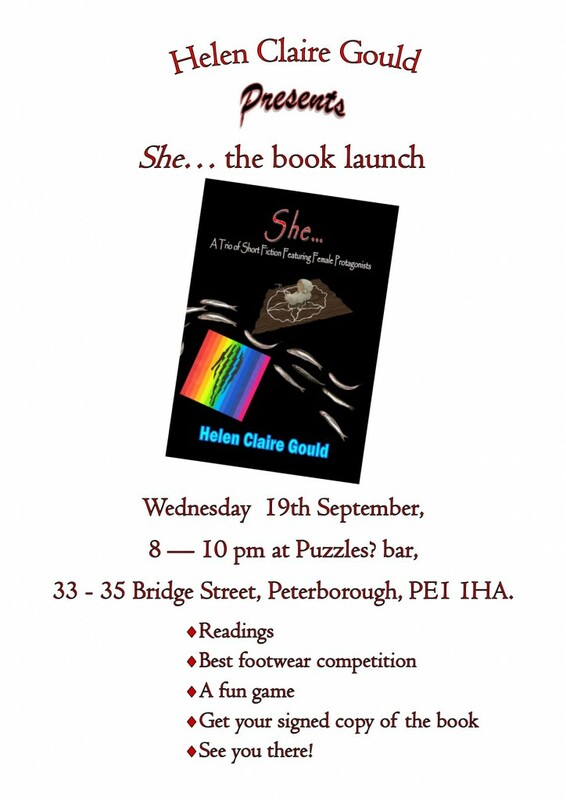 There will be a book launch for my new book, She…, on Wednesday 19th September. The event takes place at Puzzles? bar in Bridge St, Peterborough, and will include readings, a fun game and competitions, and be topped off by a reading from yours truly from the new book. 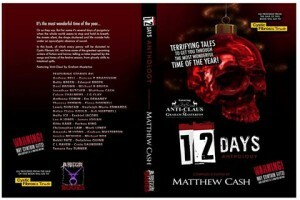 The book features 3 short stories, including two short horror stories and one longer time travel story. The launch will begin at 8.00 pm and end at around 10.00 pm, and I hope to see all of you there! In this glorious month of September, I start a new series of workshops at Boston and Long Sutton Libraries. I’ll be starting right back at the beginning, with Getting Started, which is basically a chance to have a stab at writing genre fiction and learn several different ways to trigger a new story idea. 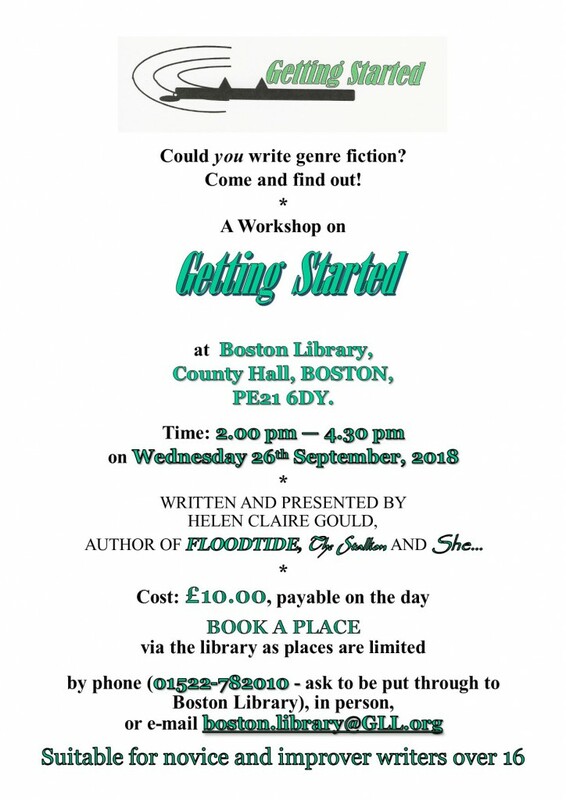 The first workshop at Long Sutton Library is on Monday 24th September, from 3.15 – 5.45 pm, while the first workshop at Boston Library is Wednesday 26th September, from 2.00 – 4.30 pm. The posters below contain all the information necessary to book a place at either of the libraries, for all you budding authors out there. Places are limited, though, so do book. I will be doing a pre-workshop reading at each of the libraries – more information on that later. 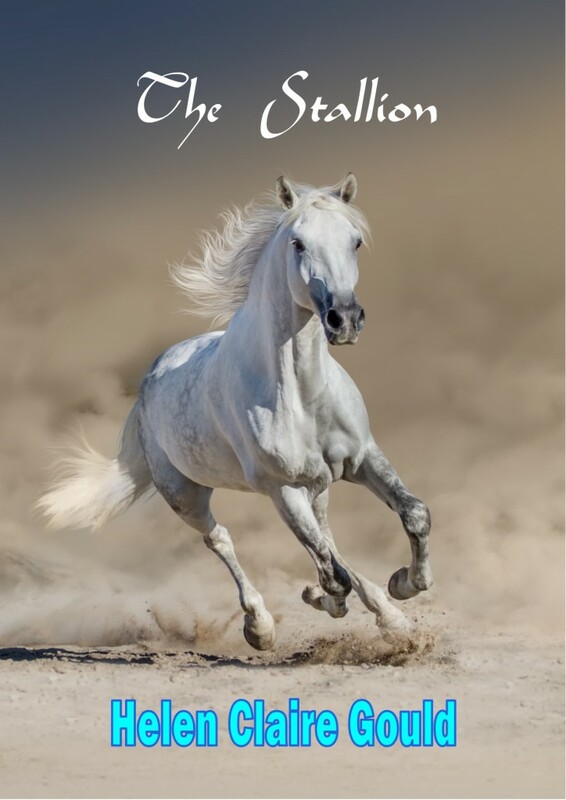 It’s here…The Stallion Book Launch! At last it’s the big day – the Book Launch for The Stallion is on tonight, at Puzzles? bar, Bridge St., Peterborough, from 8 pm -10 pm. 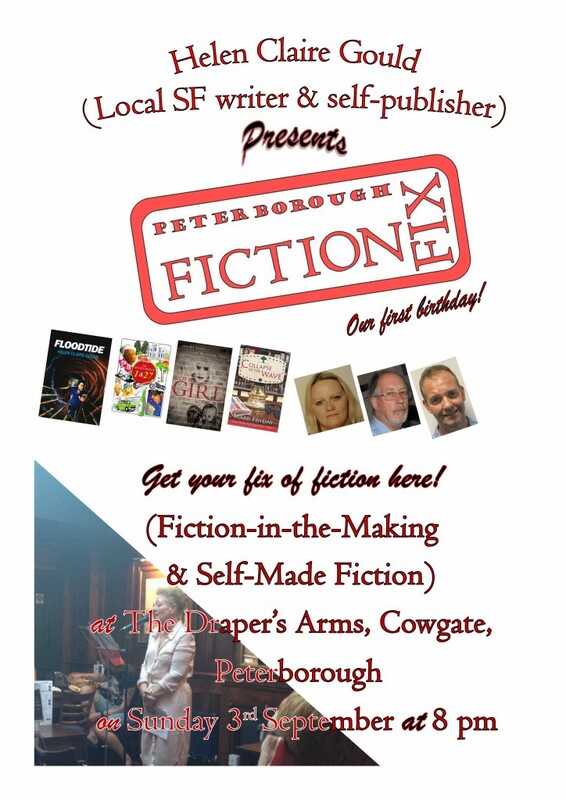 So come and join us for readings, an SF film quiz and other fun stuff, and to get your signed copy of the new book. Cover of my new book, The Stallion. The book launch went down really well, with the SF film quiz a real hit. Not everything worked, and I’ve had some ideas on improvements for the next book launch, which will be in August, again at Puzzles? bar on Bridge St, Peterborough. But it was a fun evening, and I sold some books, so you can’t say better than that – at least for a book launch. I enjoyed it too, and felt very confident as I compered the night. I would just like to mention that attendees included Khush, a regular at Fiction Fix and What the Thunder Said – he won the Spiketail Dinosaur Easter Egg which was the prize for the film quiz – and Mel and Alun Williams from The Green Back Yard. This lovely couple are well-known around Peterborough, as they try to support a lot of events, and their presence is always welcome. They do their best to support many local events promoting the work of creators of all stripes. Many thanks to you guys for coming along and supporting the launch. Guest readers were Colin Brett, a new local author of speculative fiction and a regular reader at Fiction Fix, and Andrew Wilson, who writes high fantasy as ARD Wilson. The three writing genres complemented each other as they represented different sub-genres of SF. Many thanks to both of you for your fabulous readings and support of the evening. Matt from Puzzles? says he’s had some very favorable feedback about the evening – unfortunately he couldn’t be there. We missed you, Matt! Lovely to see Sarah, whom I originally met at the Huntingdon Library Workshops. Thanks for coming along and joining in! And it was definitely a fab night. There will be a new series of writers’ and self-publishers’ workshops starting at Bretton Library in April. Leaflets for the whole series have been printed and are being distributed over the next few days – you will be able to pick them up at the library itself and other venues in Peterborough, so keep a look-out for them! To find out more or pay by PayPal, go to the Workshops page. Continue reading here >>. 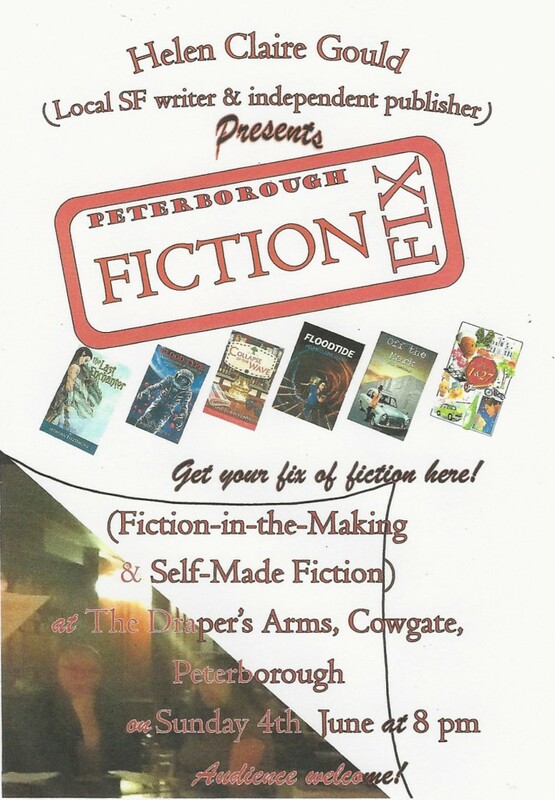 Due to the bad weather and the fact that I was poorly, we have had to move Fiction Fix for this month. We are still celebrating International Women’s Day, so continue reading >> to find out how you can help us do this. 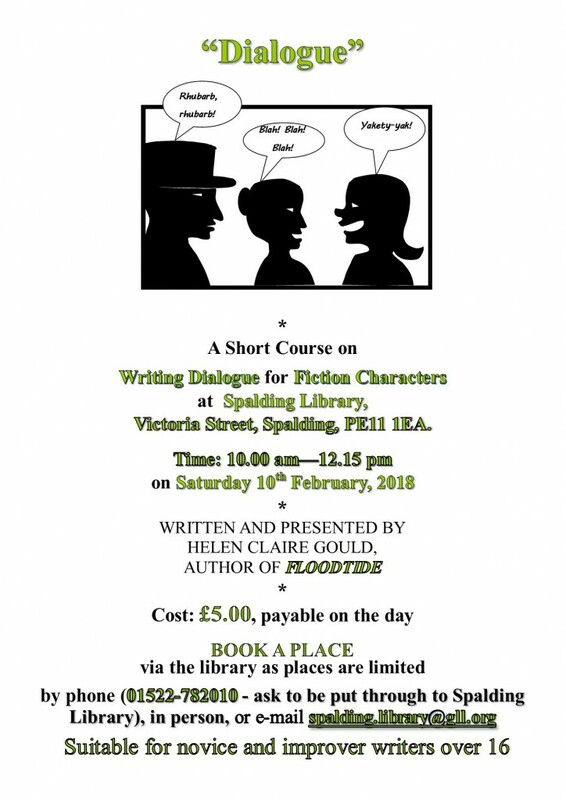 I am running a promotion on the Floodtide e-book of £0.99 in the UK and $0.99 in the US (I’ve just changed the price on Amazon, but it will take up to a couple of days for the new price to appear). This will run up to and including the New Year, so all the prices will be cheaper around the world. So if you’ve been thinking of buying a copy of the e-book, in a couple of days’ time is the right time to do so! As soon as I know the prices have been changed on Amazon, I’ll post them on here and do a post on Amazon and Twitter. As of today the Floodtide e-book will be priced at £3.49 in the UK. There is a bit of a query over the US price at present. I’m pretty sure I typed in $4.49, but it’s showing as £4.68 – probably a tax addition is my guess, but I won’t know for certain until they get back to me. My intention wasn’t to charge more than that price I chose, so if you’re in the US and thinking of buying, hang on for a few days and I’ll sort it – I do apologise, especially as the rest of the world is based on the US price. The new lower prices will apply from now on, unless I choose to run it at a lower price again – in which case I’ll let you know! Update: I did query the change with Amazon, and it took them several days to get back to me. They also weren’t very clear about why the price difference, but I was right in that it is related to tax. Last time this happened I got some help to update it to the price I wanted, but I’m afraid I have had several onerous things to deal with this autumn, including a broken wrist, and haven’t kept on at them to sort it. But there’s good news on the horizon for any prospective buyers (see above). I’ve been reviewing the price of Floodtide. The result is that it will be 0.99p (or 99 cents in the USA) from today till the Monday after Fantasycon (2nd October), at which time it will go back up, but to a new, lower price of £3.49. This celebrates the fact that we have a science fiction/fantasy/horror convention in the city – and it’s going to be a fab weekend! Fiction Fix last Sunday was awesome, if somewhat different from usual…because it was a year ago this month that the event started, we had cake at break-time, which seemed to go down rather well, if you’l excuse the expression! There were a couple of last minute changes to the readers in the Self-Made Fiction section. Gary Francis-Williams had been scheduled to read after my reading from Floodtide but found himself unavailable and Chris Donaldson was also otherwise engaged. Undeterred, Gary’s slot was taken up by Colin Brett, who read the next instalment of his ghost story Is There Anybody There?, and Pete Cardinal Cox read a story originally entitled Trans, which was published in the Noughties as Morpho. To finish that section Mark Fryday read from his latest novel, Another English Civil War (Tales from the Red Lion Part 2). After the break, new reader Mary Hagger, writing as Mary Leen Hagger, read from her novel British, Belgian, Blue in the Fiction-in-the-Making section and gave a very polished performance. Next up, Brian Jones wasn’t able to read his work and come along, so Colin read two of Brian’s short stories, Rubbish and A Bolt from the Blue, and I finished the slot off on Brian’s behalf with My Friend Jack. Then another new reader, the second of my proteges from the Spalding Library group, Terry Roberts, entertained us with an extract from his novel Ward 27B, and had us all giggling and laughing with his wry observations. Well done, Terry and Mary! You see? There was no need to be nervous! I finished the evening’s entertainment off with a reading from The Zarduth Imperative: Discovery. In fact, well done to all the readers, and welcome to new member Yasmin. It was a fab night, and we all enjoyed it. See you next month! 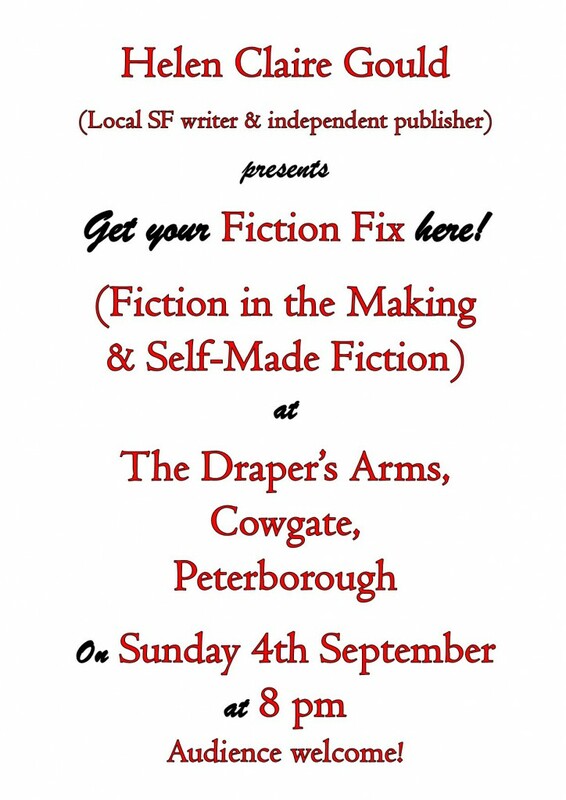 Next Events in September: Fiction Fix is One Year Old! 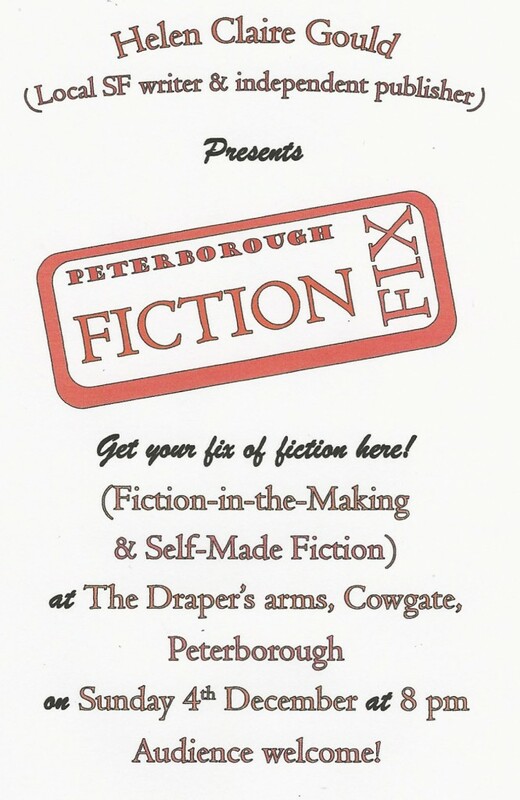 If you like being read to, or would like to read yourself, why not come along to Fiction Fix? It’s a monthly meeting of local (but ‘local’ goes out a long way) authors in any genre who get together in The Draper’s Arms on Cowgate and read their work out loud. An audience is always welcome, so come along and listen to the hottest authors around! There is also a Facebook group for both authors and audience, The Finger on the Pulse. Regrettably, due to an accident 10 days ago, this has had to be cancelled. There’s another in November, to be notified later. 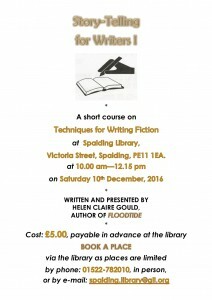 On Thursday September 7th, learners on my writing workshops at Spalding Library get the chance to share their fiction with the public. From 3.30 – 5.30 pm, the public are welcome to drop in to hear them, have some refreshments and stay as long as they want (and can) to listen. Do try to make a date for this in your diary! If you live in the Spalding area you can pop into the Library to pick up leaflets about this event in advance of it. 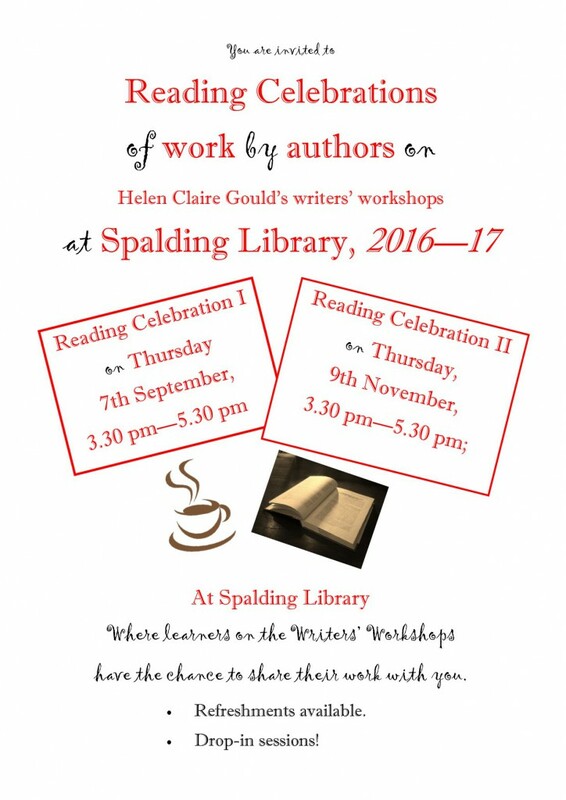 Poster for Reading Celebrations in September and November at Spalding Library. Please note that this workshop has regrettably, due to an accident 10 days ago, had to be cancelled. It will be rescheduled for October. 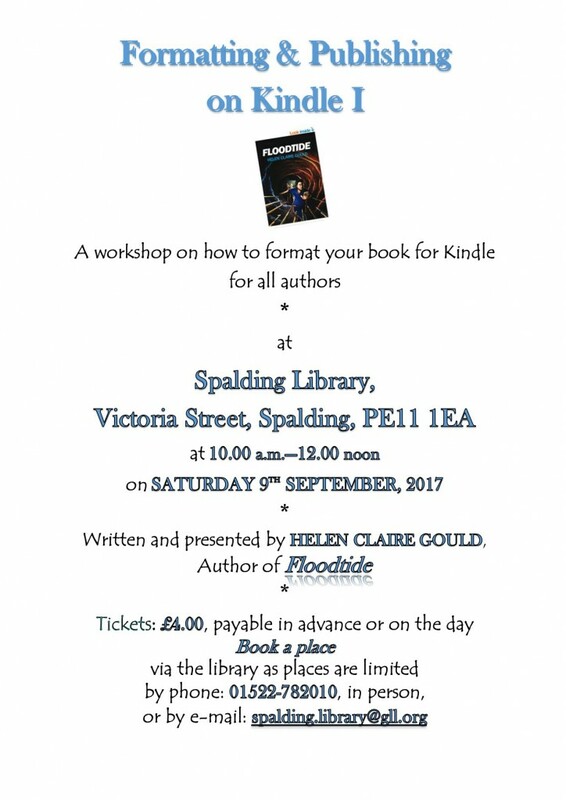 Saturday 9th September sees a slightly shorter workshop on how to format your novel or short story for Kindle. The shorter time is reflected in the £4 price, but there will still be a friendly and supportive atmosphere, with refreshments available. Being dyslexic, I had some difficulty with the instructions Kindle provide for formatting and uploading your work, so I simplified them for myself for ease of use. On that basis, we will look at how to upload novels and short stories. The next workshop deals with the more administrative part of the process. The next meeting is confirmed as Sunday 17th September, between 2.00 and 4.00 pm, at Bewiched coffee shop in Peterborough’s Bridge St. A great place for coffee and super-comfy for meetings as well. 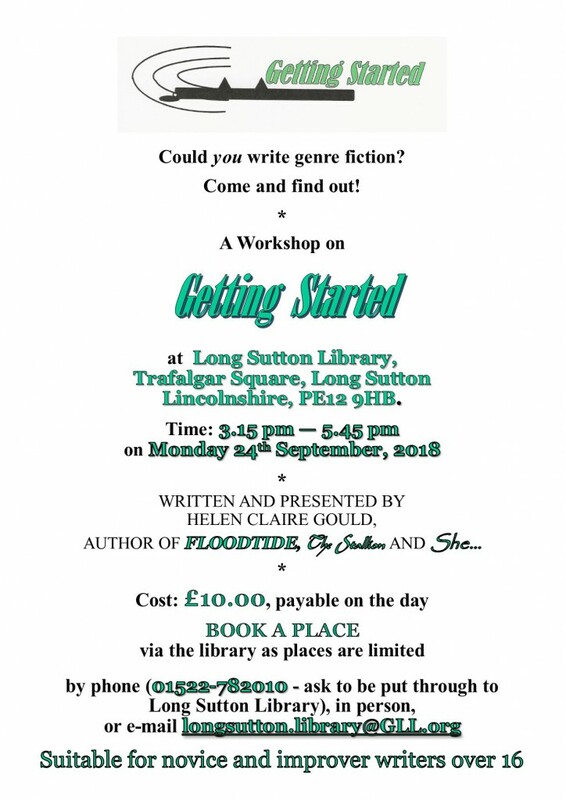 Anyone who has been to a previous workshop run by Helen Claire Gould or read at Fiction Fix is welcome to come and join us. The last one was small but perfectly-formed! Wednesday 20th September is the date of the first of a run of three workshops at Huntingdon Library. 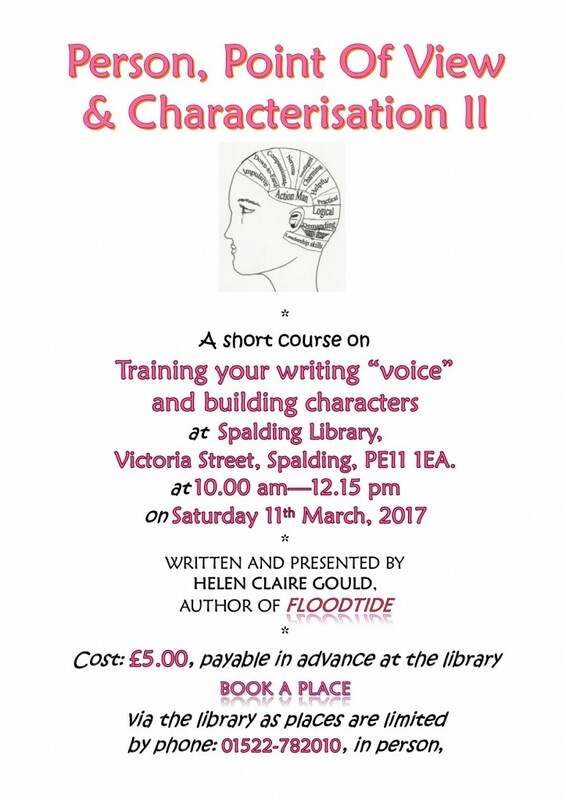 Starting at 10.30 am and finishing at 1 pm, they are designed to get you writing even if you’ve never done any wordsmithing before! 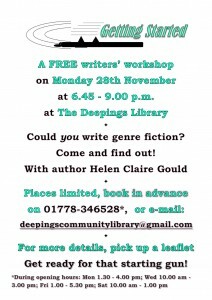 Poster for the upcoming 3 writers’ workshops at Huntingdon Library. These workshops are offered under the newly-pioneered Engage Extra programme of art and literature workshops at Cambridgeshire Libraries. Actually, there are not one but two shorter workshops this month. A couple of weeks ago (9th September) we learned how to format work ready for upload to Amazon. 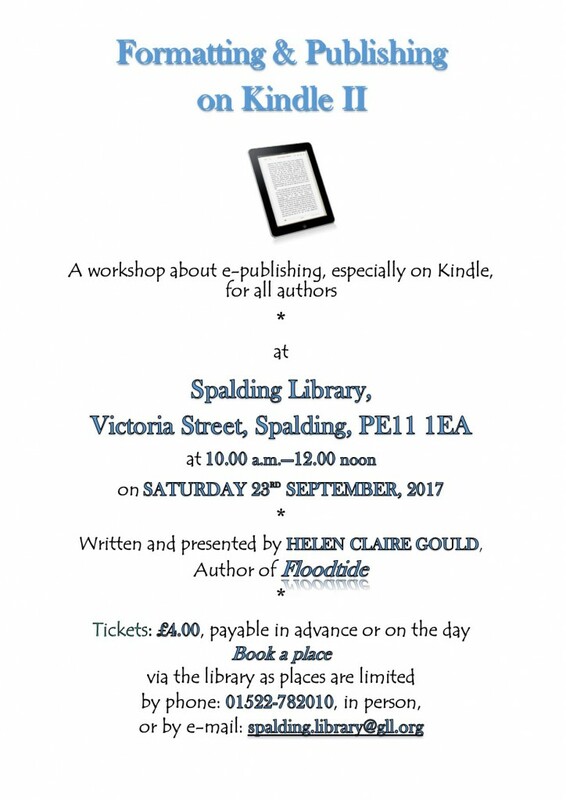 On Saturday 23rd September you can learn about the rest of the process of uploading your e-book to Amazon – now that it’s correctly formatted! As with all these workshops, you can book for them at the Library and pay on the day, or book at the end of the workshop for next time and either pay then to reserve your place or on the day. There is no charge for Fiction Fix, the coffee meet, or the reading celebrations. Hope to see you there! 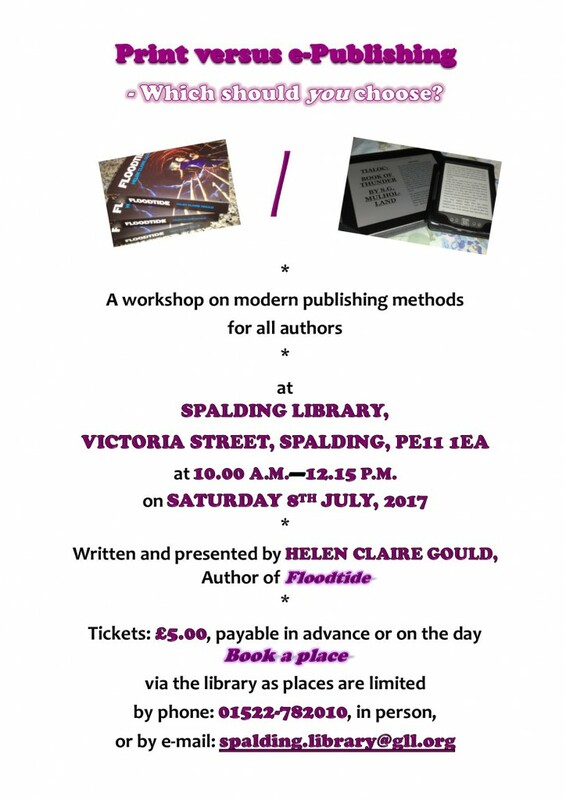 As well as the self-publishing workshops, there are a couple of celebrations of work produced by the group at Spalding Library. At these, learners will read their work aloud, and the public are invited to come and listen. It’s on a drop-in basis. More information nearer the time. 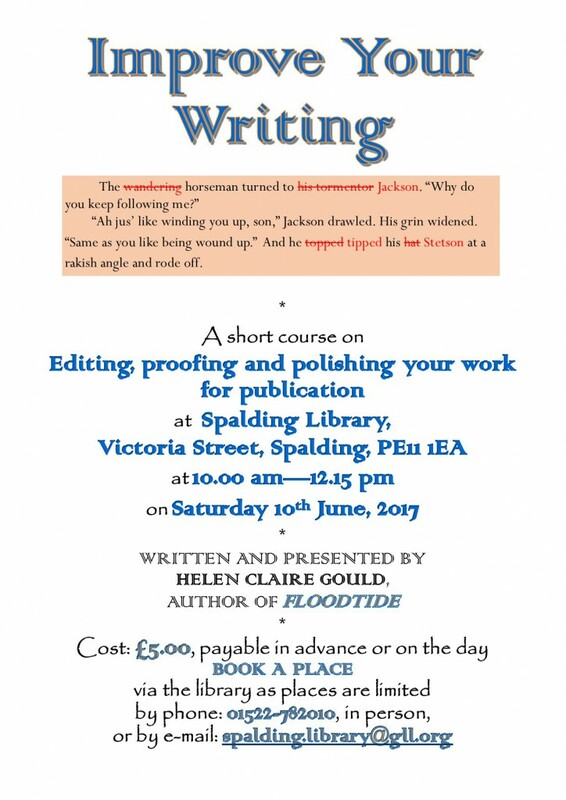 The next writers’ workshop at Spalding Library will be the last in the series of writing workshops for the time being, but next month we begin a series of workshops on self-publishing. This time, we’ll be focusing on proof-reading and editing your work, and generally polishing it prior to publishing it. Bring your work with you, as you’ll need something to work on! And as always, places can be booked via the library, contact details on the poster below. Hope to see you! Expect something a little different at this meeting! There will however be the usual multi-genre eclection of self-published, independently-published and unpublished local writers, along with an open mic session. Come and join us for a free evening’s entertainment – it’ll be fun! 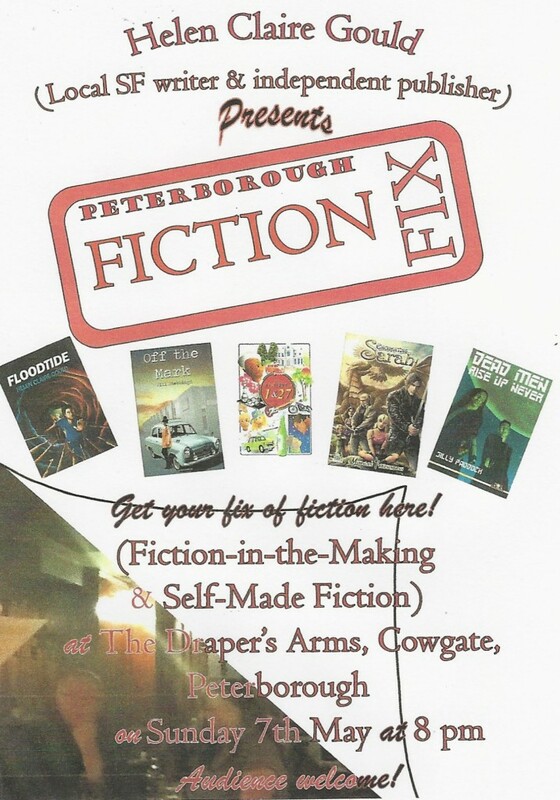 Poster for Fiction Fix for June meeting. 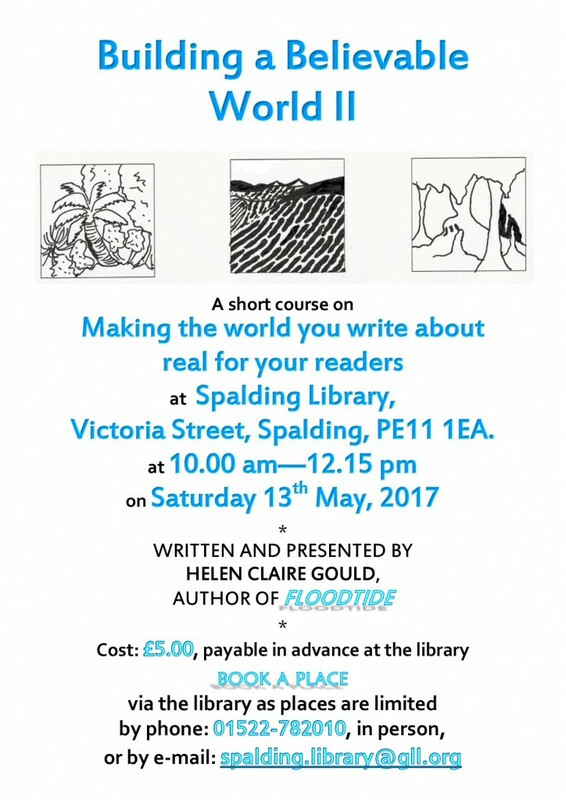 The next workshop topic at Spalding Library, on the 13th May, will be Building a Believable World II. We’ll be looking at some tools writers can use to make their worlds more real, and some writing techniques for this. This event was very successful and the participants have told me how much they enjoyed it. I enjoyed running it as well! It was regrettable that I had to cancel yesterday’s Fiction Fix, but my hay-fever has been bad all week. It’s nothing to do with hay, really – just that ghastly yellow stuff that they grow in the fields around here! I’m a bit better now, but although I’ll be reading at my usual venues I do need to avoid over-use of my voice still. Anyway, we will be back next month, with something a little different in terms of performance reading. See you soon – keep an eye out for the next poster! 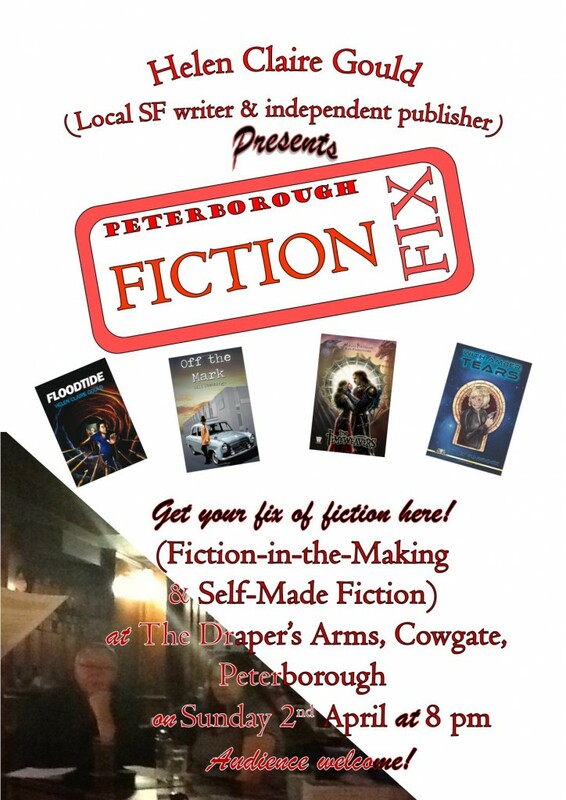 The May Fiction Fix is at the usual location, The Draper’s Arms, at 8 pm on May 7th. 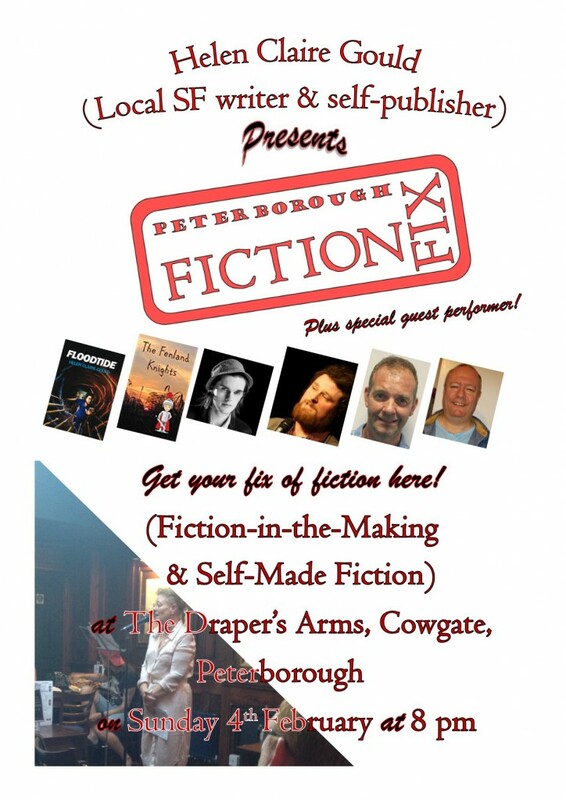 This is a free night out, with local authors reading from their work. Please come along and support it. Unfortunately this event had to be cancelled due to unforeseen circumstances, but we will be back bigger and better next month. Stop press! I will be part of the Oundle Literature Festival, at a local author event on Friday May 5th. The fun starts at 7.30 pm, at St Peter’s Church, Church St., Oundle, when I and 2 other local authors will be interviewed by Helen Shair, who started and runs the Oundle Literature Festival. tickets are just £5, and after each of us are interviewed there will be time for questions from the audience and the chance to buy signed copies of our books. Regrettably this event was cancelled due to circumstances beyond the control of the organiser. Poster for Helen’s Author Event at the Oundle Literature Festival. 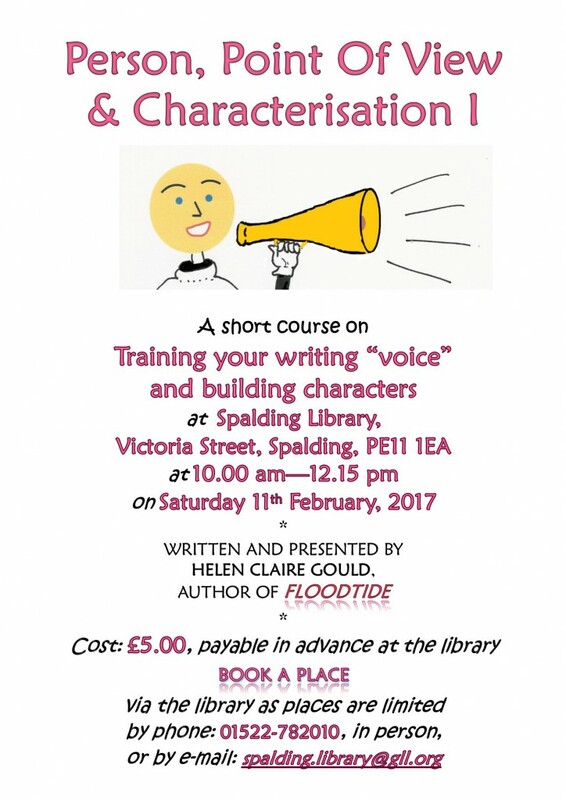 The next workshop topic at Spalding Library is world-building. Whatever genre you write in, be it SF/fantasy or horror, spy thrillers, murder mysteries or historical romance, you’ll need to make your setting believable as part of your campaign to keep the reader turning the page. Here’s how! 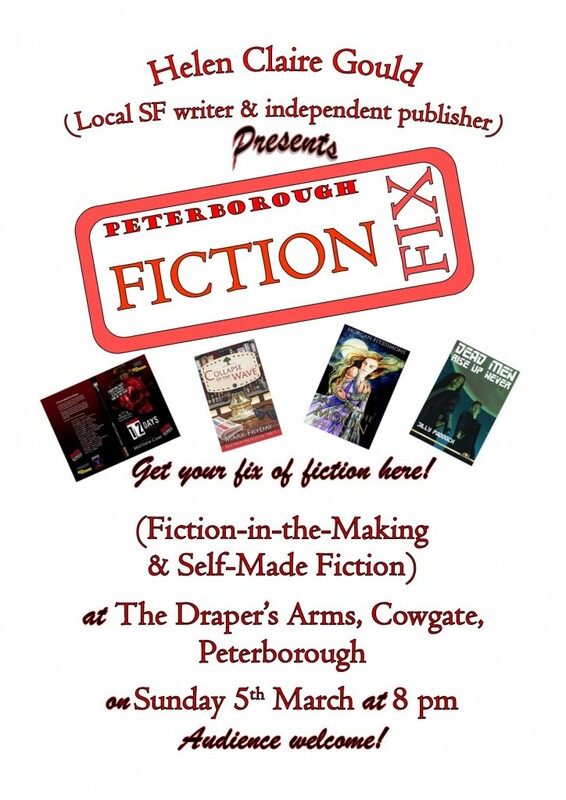 Fiction Fix returns on 2nd April with a new local author among the regular contributors to this event. Will Stebbings reads from his novel Off the Mark, along with regular readers Jilly, Morgan and Helen. Other readers still to be confirmed. 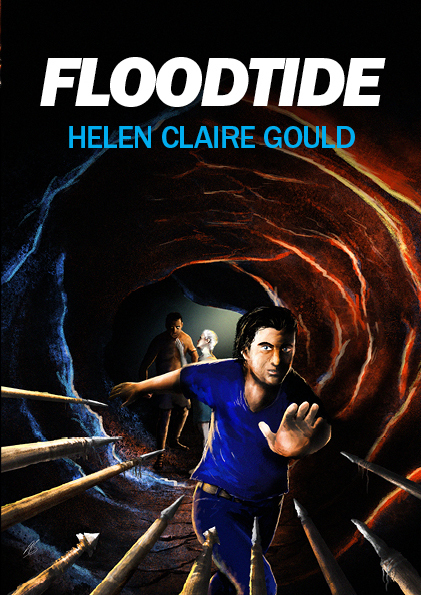 The final chapters of Floodtide are now available to read – sorry for the delay! 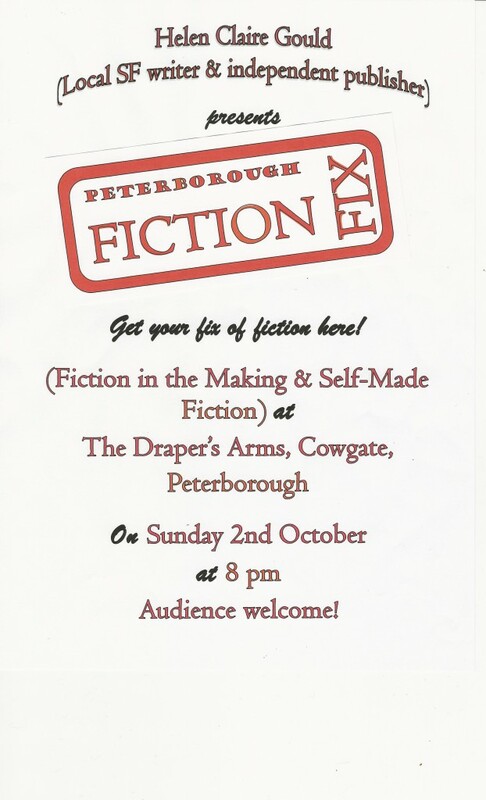 Sunday night’s Fiction Fix brought a cancellation, a new reader, and a rather chilly night to Peterborough! We opened with local SF writer Jilly Paddock Paddock reading from her short story The Third Worst Thing that can Happen on Mars, followed by poet and artist Graham Ward reading his short story Rocket Man. 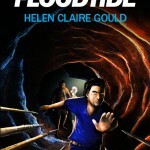 Helen Gould then read a selection from her novel Floodtide which followed Chixi, one of the two villains in the story. After the break Jilly read from her novel Starchild (in the Anna and Zenni series which also includes With Amber Tears). Ron Graves sent his apologies so new reader Sean McCann stepped in with his story Mothrolites, and read with enormous passion and energy! Helen finished with a couple of scenes from the second part of her upcoming novel The Zarduth Imperative. It was a cool and rather dreary night, but we had fun, and it was warm in the pub, mostly, and had the great atmosphere of a British local which is an essential background ingredient of this type of event. 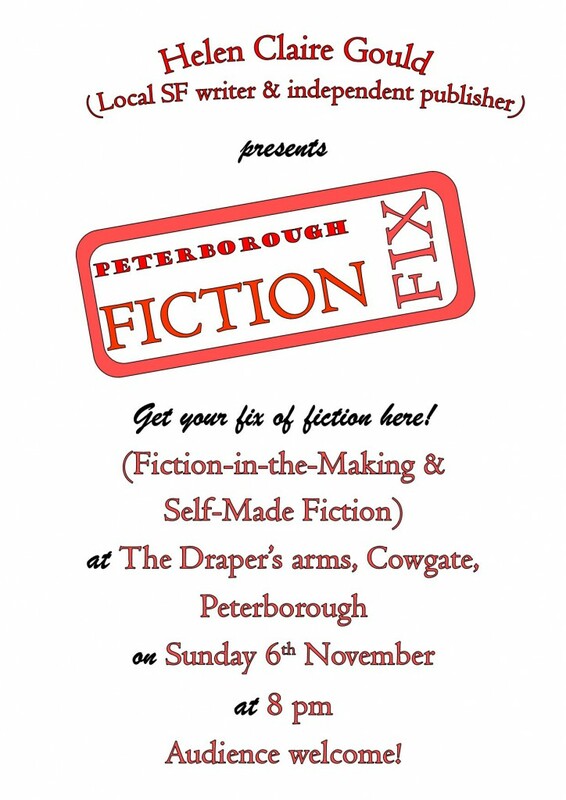 Peterborough Fiction Fix now has a Facebook group: The Finger on the Pulse. 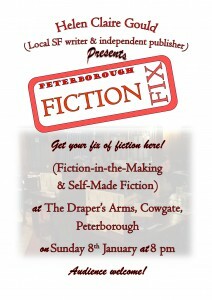 If you’re on Facebook and are interested in being part of Fiction Fix, PM me and I’ll add you as a member of the group – that way you’ll get up-to-date information about this monthly event as it gets posted. Latest events – read all about it! 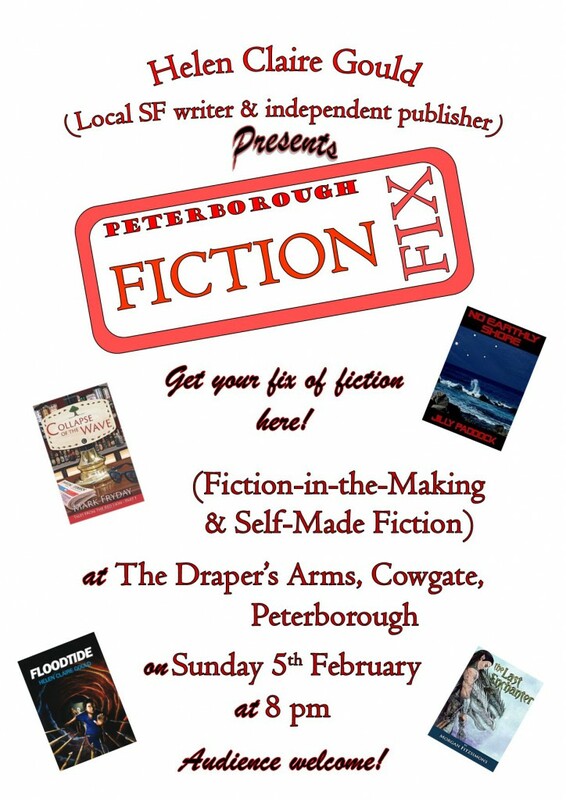 Fiction Fix took place on Sunday at The Draper’s Arms despite the cold and the rain and the lack of an audience this time – probably because of the aforementioned! Readers this month were, in the self-published/independently-published section: Helen Claire Gould reading from her novel “Floodtide”; Paul G Jackson reading from his novel “Boomshot – Hunt for a Killer”; and Morgan Fitzsimon reading from her fantasy novel “The Last Enchanter”. In the Fiction-in-the-Making section, Jilly Paddock opened with a reading from her upcoming novel “Warbird”, and Helen read from her current work-in-progress, “The Zarduth Imperative”. We (I’m talking collectively here!) 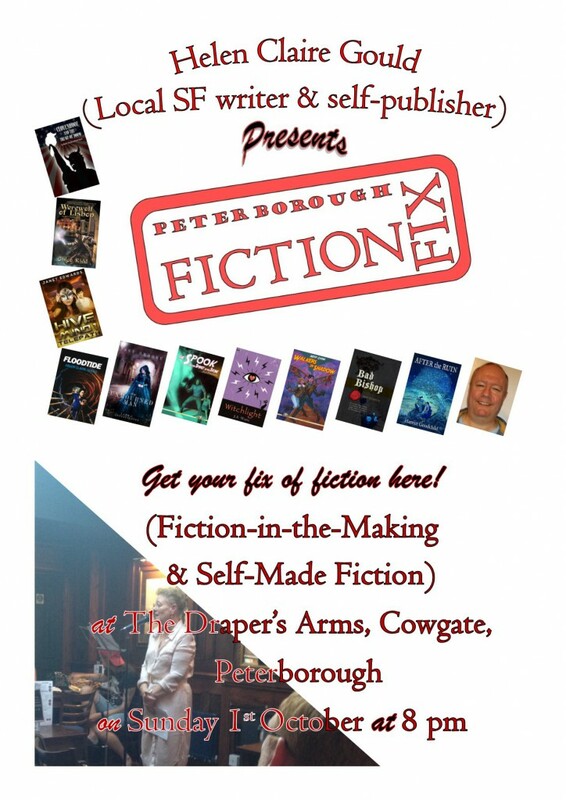 held the first Peterborough Fiction Fix on Sunday 4th September, at The Draper’s Arms on Cowgate in Peterborough. “We” consisted of myself (and my husband Mike came along to help), guest author Mark Fryday, local author Jilly Paddock, Ron Graves, poet extraordinaire and the founder of The Draper’s Arms Sunday night Poetry Gig, and Pete “Cardinal” Cox. A further contributing author was Brian Jones, but as Brian was unable to read – he had to look after his wife who was poorly, but did pop in briefly before we got going – Ron and I each read one of his short stories. 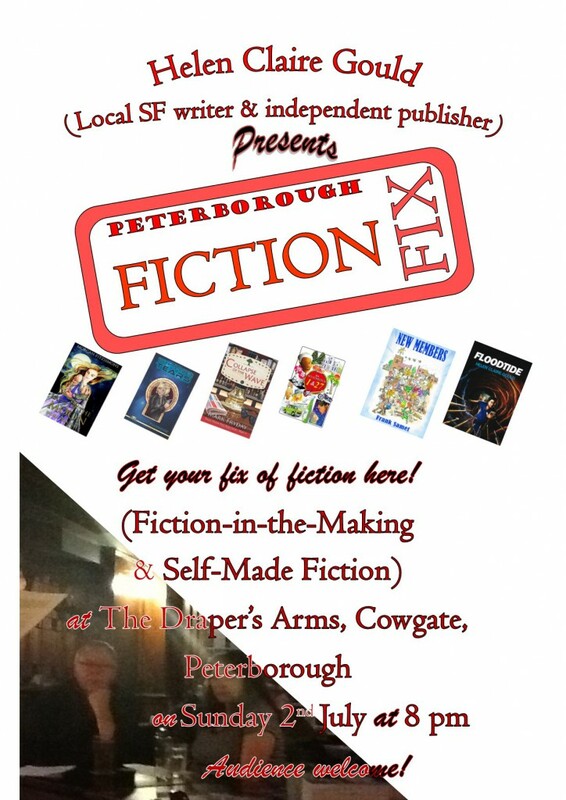 Are you a writer living or working in Peterborough? Have you self-published your novel(s) or short fiction? Are you not yet published, either traditionally or independently? 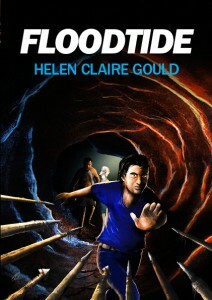 I self-published my science fiction fantasy novel Floodtide on Kindle in 2014 and as a print book in 2015. 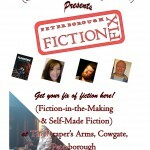 I’ve been on local radio, and done readings at science fiction conventions, but it wasn’t long before I realised that there’s very little in the way of public exposure for fiction writers in the Peterborough area, so I decided to do something about it. The answer to the first question is easy. I had a dream. In the dream, I was two people at once, and it was the most emotional dream I have ever had. Specifically, I was two men at once (well, everything’s fluid in dreams!) and both of the men loved the mysterious third person in the dream, a female. The dream took place underground, but in the caves where it happened, there was both heat and ice. And the emotion I felt was passion, and it was the most passion I have ever felt in my life. It was more than passion. It was everything. Read my new blog post about how I came to write Floodtide here. You can buy the print version of Floodtide from this site by going to the PayPal buttons on the Out Now Page. Read what other readers have said about Floodtide on the OUT NOW PAGE, and read chapters 1 – 3 for free here. If you’ve been eagerly awaiting the latest chapters, I’m so sorry. We got back quite late yesterday from Lincoln, where we went to a music festival which included sets by Julie Felix and Lindisfarne. But I have updated the serial today, so the new chapters are Chapters 12-14. Enjoy…and I’ll try not to be late with the next 3 chapters next time! Starting today (1st May 2016), Floodtide will be serialised on this website. Throughout May you can read the first 5 chapters, and from then on the chapters will change on the 1st of each month. In June chapters 6 – 8 will be put up instead of the first 5 chapters, and in July chapters 9 – 11 will replace them, and so on until the serialisation finishes on the 28th February 2017. At that point, the first three chapters will go back up on www.Zarduth.com. So tell all your SFF-reading friends about this opportunity to follow Jordas, Yado and Soolkah’s adventures both on Naxada and off-planet, and encourage them to follow the serial! 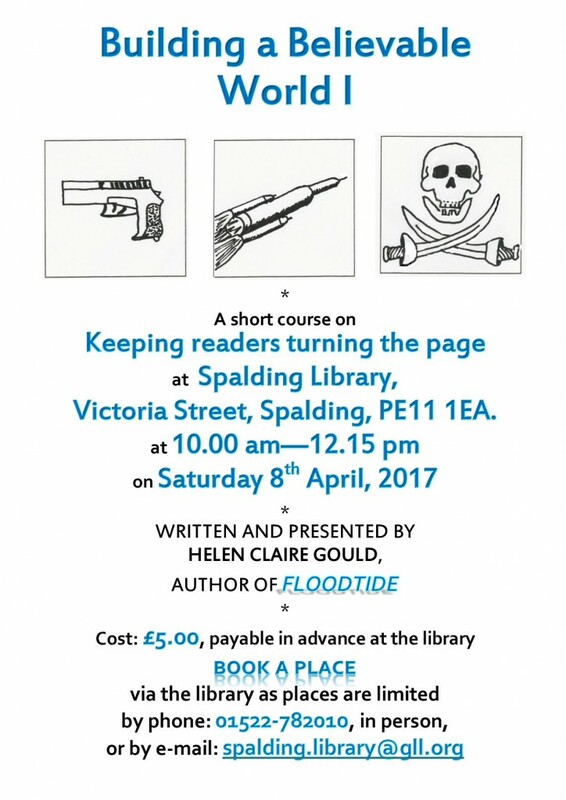 Incidentally, if you can’t wait to read Floodtide on this site, you could consider borrowing it from either Peterborough Central Library or Stamford Library – it’s already on the shelf there (science fiction and fantasy section). Update on Stockists of Floodtide/Novacon report. I haven’t been idle while the website was down for maintenance. I’ve been contacting shops, carrying out various events, and I’ve even been on TV, promoting the book, talking about writing and doing a bit of geology. That should be released later on, but in the meantime you can catch up with me on Cambridge TV on their website at: www.cambridge-tv.co.uk/The-Mac-episode-4/ This will take you directly to the programme I was in, although I was on right at the end of it, and it was heavily edited. I have also run a workshop on Plate Tectonics and the Rock Cycle at Novacon, the SF convention which is run every November, which included a PowerPoint showing the relationship between plate tectonics, the rock cycle, the atmosphere and surface processes of the Earth, and a possible connection between the Moon and the origin of plate tectonics. The session was for just an hour, but also included was a selection of rocks, and I was able to show how they fitted into the various rock types on Earth, and show workshop participants how to use a hand lens to view rocks up close and personal. As the hero of Floodtide, Jordas, is a geologist, rocks are a major feature of the promotion of the novel, so it seemed logical to run a workshop as part of the convention. Close Encounters comics shop, at 59, Midland Road, Bedford, Bedfordshire, MK40 1PW. Other stockists will be added in the near future. In the meantime, the e-book version of Floodtide is still available from Amazon Kindle. Furthermore, Floodtide will be available to order on-line soon, directly from the website. To support all this, there is currently a teaser out on YouTube, which has been joined today by a book trailer – a little insight into the elements which give the book its twists and turns. The links are on the right-hand side of this page. In addition, a book launch is being held at Waterstones in Peterborough, at 7 – 8.30 pm on October 1st. This is a Thursday night, and also happens to be the late shopping night in Peterborough. So come along and get your copy, get it signed at the same time, and there will be a display of rocks that would be encountered in the lava tubes of Naxada. If you haven’t visited the website before, or seen the teaser or trailer, you’ll also be able to see all of them. Can I have that? Well, other people seem to invent neologisms all the time…and on Friday morning I was a guest on Cambridge TV’s arts and entertainments show. I was interviewed by Sophie Blount, during which time we discussed how Floodtide came about and other similar questions. I also took along my signature rocks and minerals, which were a great hit with Sophie and the production team. I was really happy with how the interview went, and enjoyed it very much. It’s possible that I’ll be invited back to follow up on the geology at some point. It aired on Friday evening on Cambridge TV, which is available in the Cambridge area, but can also be viewed on the internet. As soon as I have the link I’ll post it here. This week I’ve been on two local radio stations, Rutland Radio and BBC Radio Cambridgeshire. My host at Radio Cambridgeshire yesterday was Sue Dougan, whose show is on from 12 noon to 3 pm on weekdays. I felt it went really well, and enjoyed the interview very much. If you missed the show, you can listen on i-Player. I had a fantastic day last Saturday at Peterborough Central Library, on Made in Peterborough: Authors’ Day. I arrived about half an hour before the event was due to start and set up on my table. I had a display of rocks and minerals which might be encountered in the lava tubes on Naxada, (the hero, Jordas, is a geologist and the novel has a geological setting) and my laptop, open on my website so that I could show it to visitors, along with leaflets about Floodtide (an e-book isn’t quite the same as a physical book! ), and my iPad and Kindle so that I could show visitors. On Saturday 7th February, coinciding with National Libraries’ Day, an author event featuring local talent will be held at Peterborough Central Library. I will be there all day: from 10 am to 12 noon I will have a table in the library, on the ground floor, and will have information about my e-book Floodtide, and will be speaking to the public, reading from the novel, and will have a display of rocks related to those mentioned in the novel, or related to the environment described, as my degree is in Geology and Planetary Science. Arts Festival Writers’ Workshops a success! How did I get into SF and writing? I believe that readers want to suffer with the characters, but from the comfort of their armchairs. So I made it my mission to make my writing as believable as possible. This includes using the multiple shifting viewpoint, sometimes with just two characters, often gathering information from many to build the story. I’ve been very focused in on getting my novel ready for publication and have only just heard that Graham Joyce died of cancer back in September. I met him a few times, mostly on writers’ workshops or at conventions. What a lovely guy! I always felt that if I met him I could ask his advice or opinion. I’ll miss you, Graham. Thank you so much for your encouragement to me as a writer.